Thus far the MLB Playoffs have lived up to the hype. We’ve had everything from sweeps to late inning heroics. There’s enough good baseball for close followers of the game, enough close finishes for the average sports fan and enough drama for the reality show junkie. If story lines, pitcher duels and long balls are what you crave then the MLB Playoffs have not disappointed. The NLDS between the Washington Nationals and L.A. Dodgers is headed for a decisive Game 5 and the proverbial team effort will be needed as each team looks to advance. We know that these teams did not get this far based solely on the production of the top part of their batting order.With all the star power being flashed with late-inning at bats by MVP candidates and lengthy starts from former and possibly current CY Young award recipients, how could there possibly be any focus on players batting in the bottom half of the lineup? Because baseball is as quirky a sport as there is. It doesn’t matter how many times you’ve been thrown out at second. It doesn’t matter how many times you’ve been caught looking at the third strike. It doesn’t matter how many routine double play balls that have come off your bat. All that matters is your next at bat. So who are the X-factors? Who are the two guys that will change the outcome of Game 5…these are the unlikely guys who will need to produce in Game 5. Anthony Rendon (Nationals): At this point there’s not a guy in this lineup who hasn’t proved they can hit, well other than Danny Espinosa who’s struck out far more than his co-workers. To be fair he‘s proved he can hit a long ball, 24 to be exact, which doesn’t give you bonus points on your batting average. Turns out a HR still only counts as one hit. 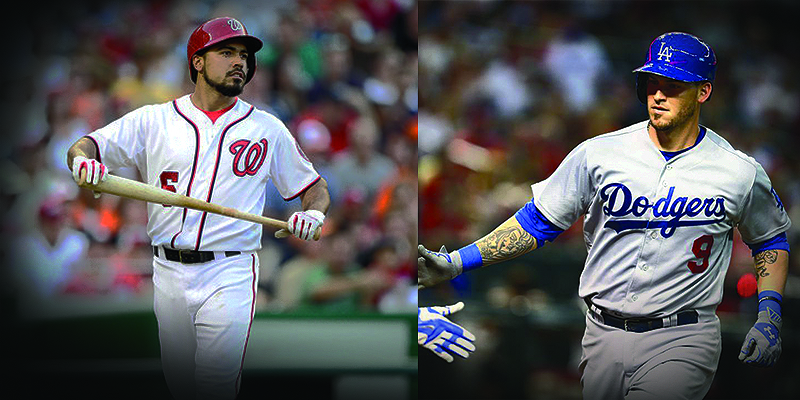 Rendon on the other hand has a batting average which put him 5th in the NL when it comes to third basemen. His numbers don’t make him a candidate for MVP consideration in any format or even a candidate as the best hitter on his team. So what do his numbers make him? My X-Factor for Game 5. He went 0-4 in the 6-5 loss to LA on Tuesday. He’s batting a rough .188 avg. during this postseason. So what makes me think he will be the difference in the closeout game? Simple. He’s a RBI genius who ranks third on the team in that category. If Washington plans on moving on they’re going to have to put up runs. Max Scherzer took the L in game one giving up 4 runs in 6 innings. He will be on the mound for the winner-take-all game. If Rendon can find his regular season swing and put his postseason struggles behind him he could be the difference maker. A lot of people are looking for Bryce Harper to produce the postseason runs but don’t sleep on the batter on deck. Yasmani Grandal (Dodgers): Grandal? An X-Factor? Batting .228 this season and he’s your X-Factor? Absolutely! Grandal might not be the guy you pick to hit the free throws or take the penalty kick but if I were looking for someone to produce runs in a hurry, I’m calling for Grandal. Nearly a third of his hits this season have found the bleachers. This is what the postseason is all about. Yeah the small ball is still in play, and yes base hits still win games but when you have pitchers that give up maybe 5-8 hits a game, you’re going to want to make those count! He has done that. Grandal has the power to change the game, the series and possibly the entire season for the Dodgers. What would a 1908 Cub say to a 2016 Cub?